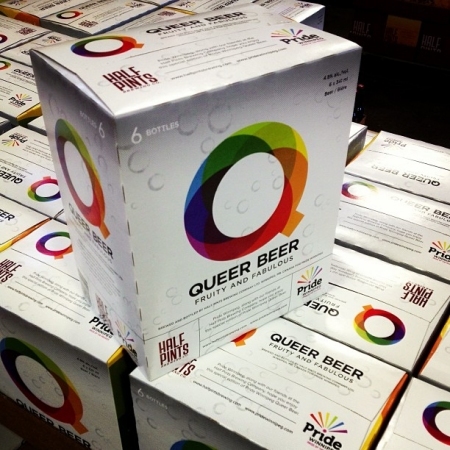 WINNIPEG, MB – Following on two previous annual editions, Half Pints Brewing has announced that Queer Beer – a limited edition brew created in partnership with the Pride Winnipeg festival – will be returning for a third year. This year’s release will be debuted at a launch party and Pride fundraiser tonight (Friday May 10th) at Club 200 (190 Garry Street, Winnipeg). The full release will follow tomorrow (Saturday May 11th) when it will go on sale at select Liquor Mart locations in Winnipeg, the Half Pints retail store, and several gay-friendly bars and restaurants in the city. Queer Beer will be available up to and during this year’s Pride Winnipeg festival, which runs May 24th to June 2nd.